Whether you want to add some color to your handlebars, or just change out the old tape, knowing how to install your own handlebar tape is an essential skill. Here I’ve put together a quick guide to wrapping your handlebars. The steps start at the point of clean/bare handlebars. So, make sure, if you are taking older tape off the handlebars that you also have removed any extra adhesive it left behind. You want to start the process completely fresh. 1. Find a secure location for your bike. A repair stand is preferable because it will keep your bike still while you work. 2. Tape your cables down. Tape them down in multiple places so that they won’t get in the way while you wrap and will be covered evenly. 3. Roll up the material that is over the part that connects your brakes and handlebars. Cover the brake-lever clamps with the 3 inch short pieces of bar tape so it is evenly protecting them on both sides. 4. Start the roll of bar tape at the bottom of the bar. Have a bit of excess coming off the bar. 5. Now wrap around clockwise. You want to always wrap over about half of the tape that was wrapped before it. Pull tight as you wrap. 6. When you get to the bend you want to still cover half of the previous tape. You don’t want to leave space. Go under the bend, and then over, and do this a couple times so to cover any exposed bar near the brake-lever clamps. Pull very tight so that no flaps are created. 7. Once you have wrapped the bend continue wrapping until the end, over all of the taped cables. Wrap a couple times after your preferred end point, and cut your tape. 8. When you get to the end (the midpoint of the two handlebars), use the electrical tape to tape down the bar tape. Use about a foot of electrical tape and wrap tightly. 9. Repeat steps 2-7 with other handlebar. 10. 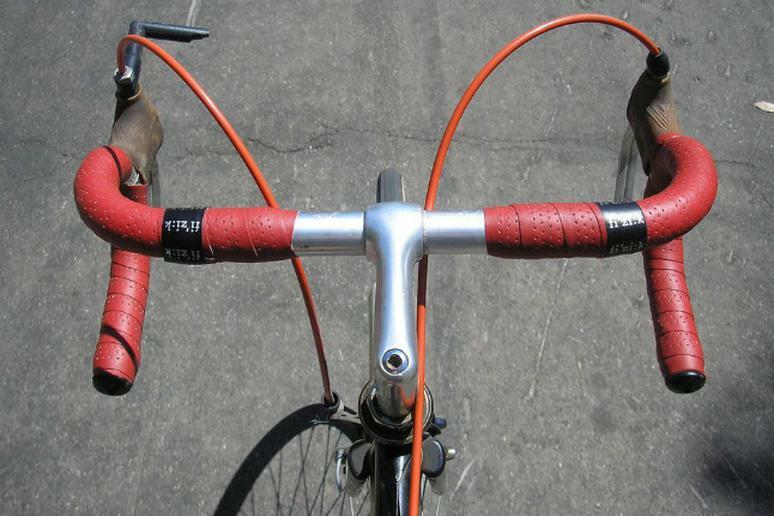 Insert your plugs at the end of each handlebar, making sure all excess tape is snugly pushed underneath the plugs. Now, your bike is looking extra unique and personalized to ride around in style.